I love a psychology-based parenting book. Not fluffy celebs prattling on and giving their two pennies worth but real scientific findings in early years’ cognitive development. I am also fascinated with teaching strategies. I have tried and tested my own ideas and gauged responses from hundreds of children in my classes over the years. My heart lies in nurture-based, child-led methods like Montessori and it’s ethos is very much integrated into my language programme. For nearly 4 years, my children and I have been attending a playgroup called Montessori Mornings. This is run by Rosita and her business partner Sorour. Both are trained Montessori-educators and are close to achieving their dream of opening a Montessori nursery in Edinburgh in 2019! I asked Rosita if she would give some details on Montessori as I know many parents who come to my classes would find her knowledge really interesting! At the end she gives details on her newest project. Hi Rosita! Firstly, can you tell us briefly about your background? Well, I was a working mum until I had my second child. I found them both so fascinating that I eventually realised the only thing that interested me was watching them grow and learn. Also, I really wanted them to grow up bilingual and the only way they were going to learn Farsi was if they heard it from me! Eventually I dived in and did Montessori training, which was a huge help to me as a mum. Dr Montessori never set out to create a method of schooling. She was doing systematic research on what makes children thrive – empirical research done primarily by observing children. And pretty early on, she discovered principles that she felt very strongly should be universally applied to education. So the core principle is that it is education based on the child; their particular psychology, their stages of development, etc. This sets it apart from other approaches that start out with a philosophy and try to mould children to fit a particular set of expectations. The Montessori ethos is that children can and do teach themselves, given the right environment. And so our role is to prepare that environment to suit how each individual learns. I love the fact that the Montessori Method is child-led. I think educators or class-leaders can often be so set on achieving their own goals that they don’t let children be in control of their own learning. For what ages is the Montessori Method applicable? Dr Montessori’s emphasis was on the first six years, because these are when the brain is most absorbent, but she later developed programmes for 6 to 12s and, before she died, an outline of a 12 to 18 programme based on the special capacities of adolescents. Today, Montessori is even being used in therapies for people with dementia! Are there subjects that the Montessori Method particularly lends itself to? Montessori often referred to the way small children absorb language effortlessly to illustrate how they absorb all learning. When my kids were little, I found it amazing how they learned to talk in two languages simultaneously. You know, all those cute mistakes they make are actually really telling of a very systematic brain. Children crave language because they are busy constructing their own language, and their understanding. In this early, super-eager stage, we give them correct grammar and the correct names for things, to help and not confuse them. When they hear the same words later in childhood they immediately tune in and are interested in everything because they have been ‘primed’ by their earlier experiences. So I would say language is the one objective that weaves through the entire Montessori curriculum. Another is movement. Children learn through their senses, so they need to see, touch, smell, experiment with tactile things, and move their body. Is there a set way for introducing foreign languages in Montessori? There isn’t a set way for introducing foreign languages in Montessori, but if there were it would probably look a lot like Mini Languages, where it is the familiar expressions and objects that are used, with props, songs and actions, and a lot of repetition. Finally, I hear you have big plans in Edinburgh – how are they coming along? Prior to my Montessori training, I would never have imagined I’d be starting a nursery because what I did before was so unrelated! But Sorour and I are really excited that we are going to be able to put everything we know into practice. 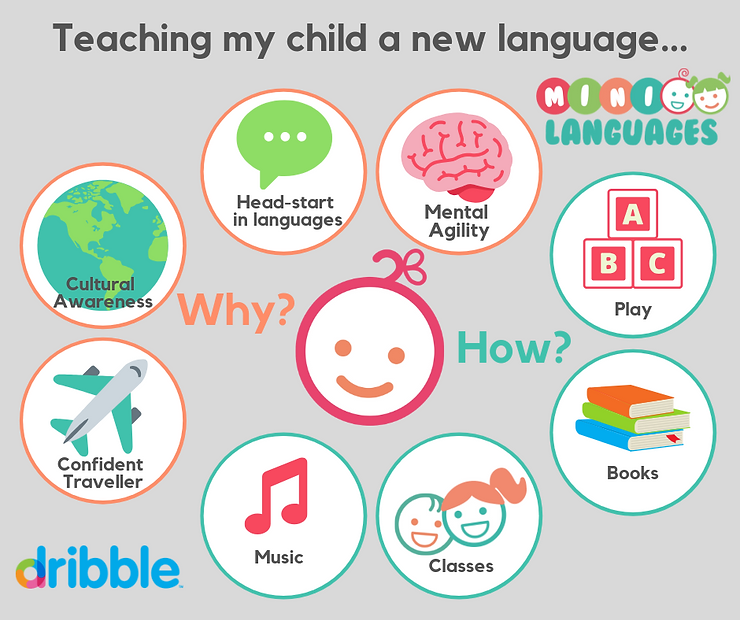 Language and literacy will be a big part of what we are going to be doing, as is working with people in our local community – that’s why we’re doublly excited about Mini Languages! Plenty of insider detail on Montessori. You can implement the ethos of independence by letting children undertake daily tasks themselves from a young age. You can arrange your household so that children can access toys, crafts, clothes and even snacks themselves. Also letting children explore learning materials without excessive adult intervention to cultivate a life-long love of learning! 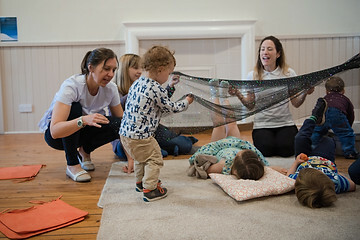 If you are in the Edinburgh areas and love this ethos as much as I do you should check out Casa Montessori – opening soon…we also hope to collaborate with the nursery and run language sessions there. So the perfect educational environment for happy, thriving and future-proofed kids! How to get French children’s books in the UK? I am often asked how to find good quality French children’s books in the UK. I love children’s books. Our house is full of them! My children have learned a huge amount of their French vocabulary from books I purchase in France. I received great feedback on a post I wrote last year with my French book recommendations on Amazon.co.uk but the selection they have currently is not extensive. Other than that you can pick them up in French bookshops, supermarkets and vintage markets. But what if you are not heading to France this year and have exhausted the Amazon list? Or you are looking for a special present for your little one? Or even to improve your own French (I’d highly recommend kids books for language learning). What if I were to tell you that there is also a service where you can have brand new, professionally selected, French kid’s books delivered monthly to your door…(I should note at this point that I have no affiliation with this service). L’école des loisirs is a renowned French language publishing house specialising in children’s books. They created the Max Book Club (L’école des max), offering subscribers eight books a year from November to June to reach a wider audience. Fortunately for Brits this service is available internationally. We have been subscribed to the service since my children were pretty much newborn thanks to their French grand-parents and I would highly recommend it. I like books from a range of publishing houses but I think most of our family favourites are from L’école des loisirs. There are eight ‘series’ or categories within the book club. Each series is designed for a certain age group. I would recommend sticking to the early age series’ BEBEMAX or TITOUMAX as they are suitable for up to age 3 and age 2 to 4 respectively but the vocabulary will be challenging enough for non-French speakers. They have simple sentences, bright illustrations and engaging stories which will have you learning French together through age-appropriate vocabulary. Through their website you can also peek inside the books to see the level. The website is quite comprehensive with some audio versions available. I’d encourage you to check it out. There are two types of subscriptions: Individual or Group. My family qualifies as a ‘Group’ as we have three children all receiving books (from different series). This qualifies us for a slightly reduced rate. £35 – £42 per child (depending on series). So if you can find two other willing friends, you could subscribe as a group as it is an attractive price for kids books. You will receive the books in one package to a single address. Otherwise, you can sign up as an individual. Prices start at £48 for the BEBEMAX series. If you have any issues or questions there is a UK contact email address on the website. To note, if you subscribe after November you receive all the previous books for that season – so you can sign up at any time – perhaps a Christmas idea from a generous relative? Or one for the Santa list? Finding French children’s books in the UK can be tricky but reading can be a really wonderful way to improve, not only your own French but your cultural awareness. So why not check out the book club and receive a little language gift every month? Bonne lecture! Have fun reading! So you are pregnant or are already a parent and are hoping to bring your child up bilingually or with a solid knowledge of another language! Amazing! I have three bilingual children and spend lots of time with families just like yours. It is a joyful journey! The good news is that you can do it. It is possible regardless of your situation. However, what you need to know is that the fact of having one parent who speaks one language well and another parent who speaks a different language well, is not sufficient. A child will not magically become bilingual without some effort from their carers. As you suspected, it is a skill to be nurtured. Don’t worry though! I have been there and can share my experience to give you some shortcuts. The photo is of my first born and I eight years ago. He was three weeks old and I was a new parent with a lot on my plate but pretty damn happy and determined he would become bilingual so he could grab every opportunity presented to him in his future. It all starts with the right attitude. Do not skip this step! It may even be the most important one. Firstly, the correct frame of mind will hold you in good stead for the journey as bilingualism is a long process. It is not like other life skills like… swimming, let’s say, where you may stop once they are safe in the water and can swim a length. Learning two languages is intertwined with life itself. It brings lots of joy but it helps to be confident in your goals and your plan. We will discuss this further in step two. There will be bumps or occasional setbacks. Times when you can’t see progress, moments when you wonder if it is ‘working’ or when you let doubt cloud your mind when a well intentioned friend or relative questions your plan. During these times and you need to be sure in your own mind why you are choosing this route. Looking back I had a pretty good attitude. I did my research and was firm in my beliefs as to the benefits of learning a second language from birth. I understood that it would be a marathon and not a sprint. What I didn’t really have was a plan. A Family Language Plan is the way in which you will ensure that you are nurturing both the minority and majority languages in your family. It helps to keep you on track. Your minority language is the one that your child will naturally have less exposure to and tends to need the most TLC. Your FLP could take the form of an in-depth discussion with your partner or it could be a genuine document where you note your ideas and resources you plan on using and add to it when you see cool ideas. Pinterest can be good for this. What is important is that you are both on the same page and are clear on how you anticipate ensuring that your child is exposed to meaningful input in both languages. It can be something you refer to when you run out of ideas or the minority language needs a boost. What is your goal for your child? Key words/ conversational/ bilingual/ bi-literate/ bi-cultured? Which languages do both parents know? Do you know the words a child will tend to use in that language? Which languages will parents speak when they have 1:1 time with their child? For bilingual families, One Parent One Language or not(this article may help)? Is it time for one or both parents to scrub up on their partners’ language? What will the family language be i.e. meal times? If your level is not very advanced in your chosen language, perhaps choose one evening when you identify the items on the table in that language instead of full conversations – French Fridays?! What other family and friends can help and have you spoken to them about your plans? Can you have a regular Skype/ Face Time session? Should there be a day or time when the minority language is encouraged? i.e. Sunday games night? How will you ensure stories in both languages are read with your child? Where can you get books? READING IS SO IMPORTANT! Do you know lots of songs and nursery rhymes in the minority language? How can you find some –Cd or download? AGAIN, SINGING IS GREAT! Are there local playgroups or language groups aimed at young children you can attend? What about babysitters and bilingual childcare? What radio stations and TV programmes could help to maximise exposure? Which cartoons are popular in the country of the minority language? Some ideas here. What “boosts” do you have up your sleeve for days or weeks when you need to increase the minority language? i.e. For younger children, a quick game using your hands? Head, shoulders, knees and toes? A favourite book, toy or song? Have you considered when you will tackle writing in the minority language, if that is one of your goals? When it comes to culture, will you try eating food from both countries? Celebrating festivals from both countries? When can you travel to a country where your minority language is spoken? This list is intended to start a conversation and not to scare you! As you will see later on, your plan can, and should be, flexed as your child develops. It also gives you a strong foundation to answer questions from friends and family giving you confidence in your approach. A Family Language Plan as unique as your family is. I will share mine over the coming months and you may find inspiration. Now you have the best attitude and an awesome plan you are ready to rock! Stand-by your plan. If you expose your child to a new language regularly, you and your child will see results but enjoy the journey! Remember to make sure that you add your own personality and, crucially, keep it as fun as possible. Watch your growing child and get to know what is working and what is not. As they develop, note their learning style – do they prefer active games, particular games or toys? Is there a class they enjoy a lot where you can get further advice? Keep it up but do not beat yourself up when the plan changes from time to time and if you are finding that there are certain parts that are just not feasible then you may want to make some changes. Which leads us to the final step. The best plans are flexible and are reviewed from time to time to keep them fresh. This is something I now do frequently with my partner. We think about each of our three children and discuss what each of them may need to advance their spoken or written French, which is our minority language. For example, we were previously doing joint evening stories with our two older boys but we realised it is time for our younger boy to begin reading in French now that he is reading well in English and understands the concept of phonics. So he now has a story with Daddy separately and they choose a book with more basic French words to build his confidence. Another example – we realised at the end of the school-term that the spoken French in the house had reduced. We made a conscious decision that on our two week holiday we would only speak French between us as adults… lo and behold the children followed. 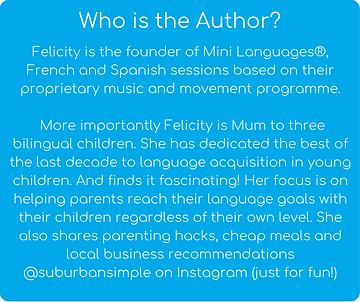 Regardless of your level – monolingual parents or bilingual parents – the principles of having a plan, putting it into place and reviewing it still apply. So what now to start bringing my child up bilingually? Take time to go through step one and two, grab a cuppa and look for local resources. Put your plan into action with support from friends and family. Then review it from time to time. Keep it fresh and fun. If you have any questions, feel free to get in touch. I love a chat and would welcome your experiences.